I would like to enable couple of my machines to access the internet through a VPN connection. My idea is that the PI can simply dial in an establish a connection and then route requests from the other machines through it. I am thinking that setting up a default router of the device to the IP of the PI. While somehow experienced with command line configuration of multitude of things, could you please point to me to directions on what packages/services I need? other network devices have default gateway set to the IP of the PI and all their traffic goes through the VPN, provided that is up (and no internet connection if the VPN is down). I do not need NAT or DHCP services (DNS can also go through the VPN). Next, you have to set the config file for the vpn /etc/openvpn/server.conf. I used the sample provided by my vpn service (Witopia) and change dev tun to dev tun0 and added redirect-gateway at the end. 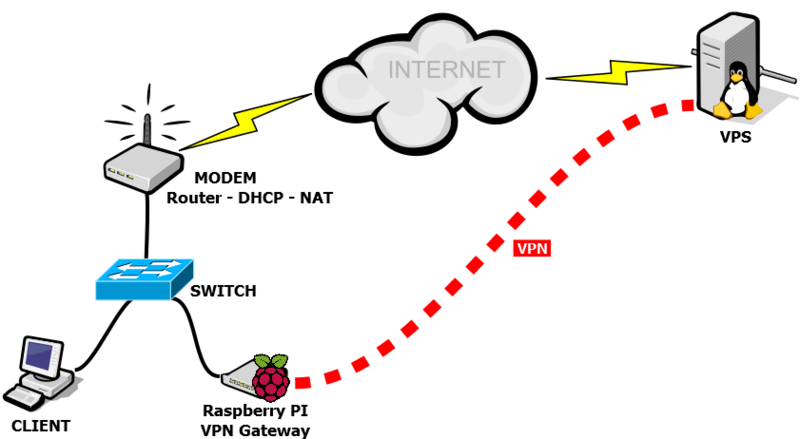 Reboot and the RPi should be connecting to your VPN and be ready to receive incoming traffic. I added a new option to my dhcp service on my router (running OpenWrt) to specify the gateway sent to the client. I added the line list 'dhcp_option' '3,192.168.1.11' to the file /etc/config/dhcp and rebooted the router. My iPad, PC and AppleTV now connect through the RPi to access external urls. Currently PPTP only (OpenVPN support coming) - check out my project called DSVR (Domain Specific VPN Router) for the Raspberry Pi. Raspbian should be close enough to Ubuntu for the setup to be the same, and I've just checked that the OpenVPN package is available in the Raspbian repo. However, note that most VPN instructions will tell you how to create a server for opening your LAN to VPN clients on the internet rather than vice-versa, so you may need to experiment a bit with routing settings. Don't know if this is useful, but I'm using VPN on Raspberry Pi from a vpn provider when I travel out of usa to china, they have a dd-wrt script which I installed and it worked from first time. So may be you can save yourself a lot of trouble if you look for a provider with already made dd-wrt script. If somebody is curious about the script I can post it here. Here is my setup which is very similar to your need; the only thing you need, installing OpenVPN client and doing some configurations on the Raspbian. Not the answer you're looking for? Browse other questions tagged networking vpn or ask your own question.